I’m no gardener, really. My little courtyard, which catches the sun for only a few hours every day, has seen a mishmash of trials and errors over the last decade. 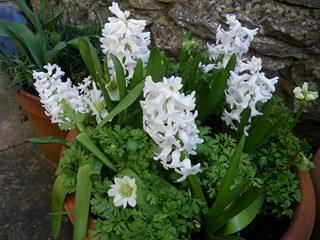 Now, I’m happy if the night-scented stock and cornflowers that I sow every year actually flower, if my honeysuckle and mock orange bushes both blossom and smell sweet, and if my purple-leaved maple tree turns scarlet in autumn. Most years, one or more of these essentials disappoints me. The maple usually shrivels up. Mock orange flowers make an appearance or not, as the whim takes them. Worst ever, in the relentlessly rainy summer of 2012, no cornflowers germinated at all, I counted just four valiant night-scented stock flowers, and the numerous honeysuckle blooms were scentless in the cold, damp air. I have only ‘a bit of earth’, as Mary Lennox in The Secret Garden might describe it. There’s a flowerbed about 3 x 7 feet, a corner plot that used to be a small sludgy pond, another tiny rectangle with trellis for the honeysuckle, and a scattering of pots. It’s tempting to cram these spaces full of my chosen plants, but, given that my choices often fail, I’ve learnt to enjoy the surprises. A lemon balm bush once sprouted from nowhere, and last year a packet of Californian poppy seeds produced one frilly-edged pink specimen among the rather boring smooth yellow and cream petals. This winter, I noticed a low-lying bunch of leaves quickly spreading near the wall in the main bed. I had an idea what they might be, but wasn’t sure, so I dug most of the plant out but left a few leaves behind to see what would happen. 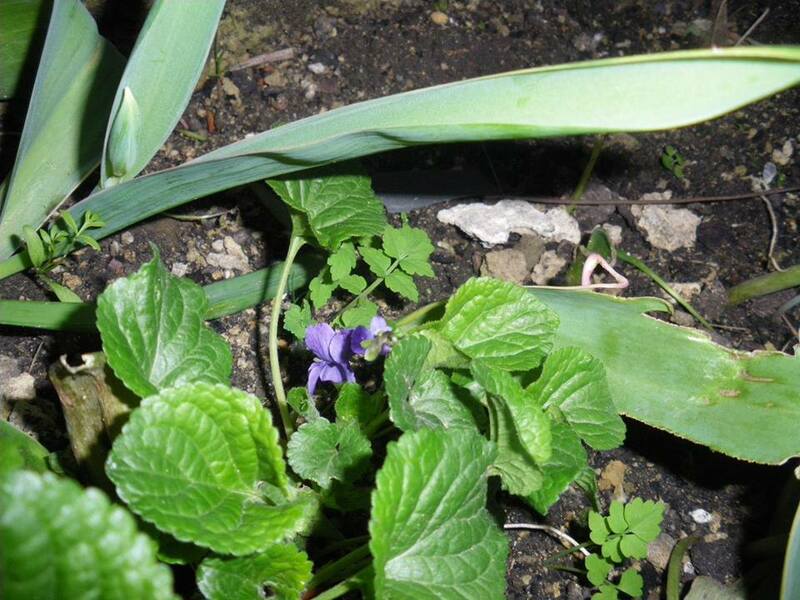 Eventually, one tiny flower emerged on a thin stem from the foliage—a guest violet. Some years ago, I planted violets in a different part of the bed, but either they died or I pulled them out to make way for some other experiment, and they were forgotten. But underground, in their own time, they’d found their way to a spot where they could give themselves another chance. 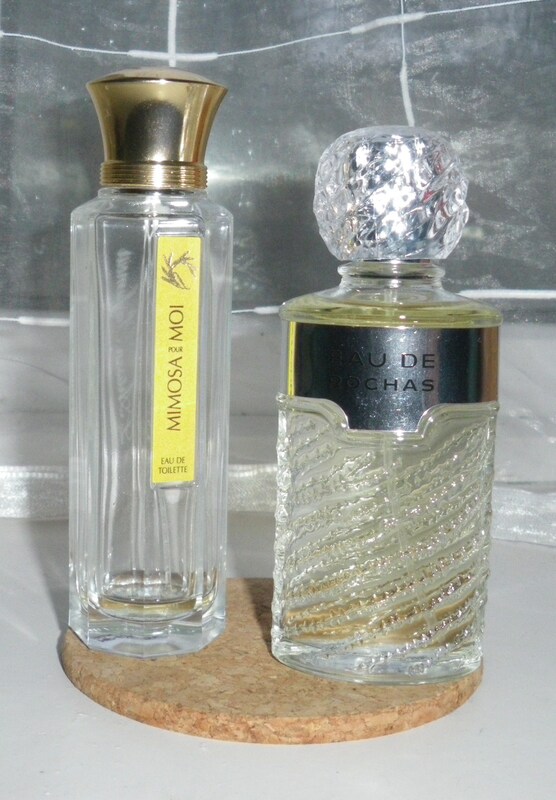 I’m close to finishing a bottle of perfume—Mimosa Pour Moi by L’Artisan Parfumeur. It’s light and sweet and sunshiny but, after about nine months of almost daily wear, I’m starting to get a bit bored with it. Lined up to replace it is an old favourite that I know I love—Eau de Rochas, which opens with a sharp lime scent that acts like an olfactory lightning bolt. It’s true that you shouldn’t try to judge a perfume as soon as you spray it, because the top notes quickly evaporate and give way to the heart of the fragrance, which could be quite different. But I’ve never found a perfume that I wanted to revisit again and again, that didn’t hit me right between the eyes at the first sniff. The psychology involved in the sense of smell is very interesting. Scent molecules enter the nose and are delivered straight to an area of the limbic system (a ‘primitive’ part of the brain) that processes emotion and memory—and that’s why scents so powerfully evoke the remembrance of feelings and atmospheres. It’s as if emotions dissolve in fragrance, waiting to be released with full force when the perfume stopper is removed. Last summer, I breathed in the scent of wisteria flowers in a garden and was carried straight back to the Old Vic theatre, to a 1987 performance of Shakespeare’s Henry IV Part One, where I sat next to a woman wearing an overpowering fragrance that, at the time, I couldn’t identify. The smell was too strong to be pleasant in itself, but my experience of the play kicked off a sequence of events that led me to become an editor. That smell of wisteria will now always be linked to a feeling of expanding horizons and the knowledge of being on the edge of something life-changing. Some of the connections that are made between fragrances and emotions are more mysterious, though. I have no idea why the smell of woodsmoke that often lingers on the air in the town where I live is so comforting, or why lily-of-the-valley makes me feel uneasy, or why the aroma of a particular white rose in a National Trust garden made me think immediately of my brother as a child. Perhaps they reflect subconscious memories that will never come to the surface. I probably won’t be wearing Mimosa Pour Moi after the last few drops from this bottle have faded away, but I wonder what memories will be revived if, in twenty years’ time, I happen to smell it again.